The women in your organization deserve more than a keynote, workshop, or retreat. They deserve a Getaway, a break from the pressure of their lives. 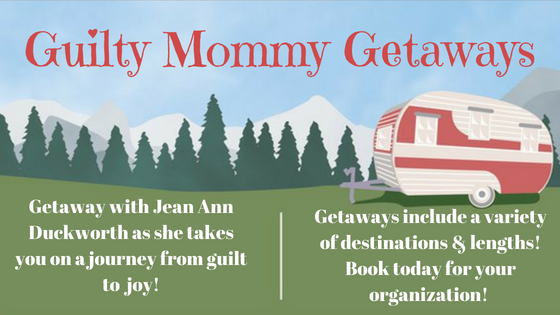 Jean Ann Duckworth has just what they need with her Guilty Mommy Getaways. Each event offers the women attending a chance to renew their spirits, to fellowship with one another, to laugh & perhaps cry, and, most important, draw nearer to God. Jean Ann helps women understand the guilt that invades their lives, explains the true identity of that guilt and help them learn to strengthen their faith as they work to become the women God created them to be. Jean Ann addresses issues of stress, teaching audiences the ways stress weakens their faith & suppresses the work of the Spirit within them. 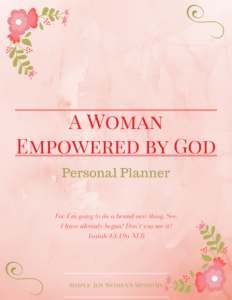 Women also discover ways to reawaken the joy in their lives & the lives of their family. She shows audiences the power in joy & its importance in the spiritual life of all believers. Jean Ann also has fun during her getaways & she makes certain women attending her events have fun too. Noisemakers, beads, crowns, & more are often seen during her getaways. After all, you should always have souvenirs from your trips! Jean Ann offers presentations in a variety of lengths & topics. For longer events, like retreats, choose from 2-3 topics for more information or choose 1 topic for greater impact. Each presentation includes either a one sheet handout or a folder of material for each participant. Contact Jean Ann today to book your getaway! Click on the title below to learn more about specific presentations!